"Searching for the best beach in Sardinia, with translucent turquoise waters lapping softly at shores of pearlescent ivory sand?" Sardinia, Sardegna in Italian, is the right place to visit if you are looking for some of the most natural and beautiful beaches to be found anywhere in Europe. The water colour off these beaches shifts through every shade of turquoise and emerald during the day, simply inviting the visitor to strip off and dive in for a refreshing dip. 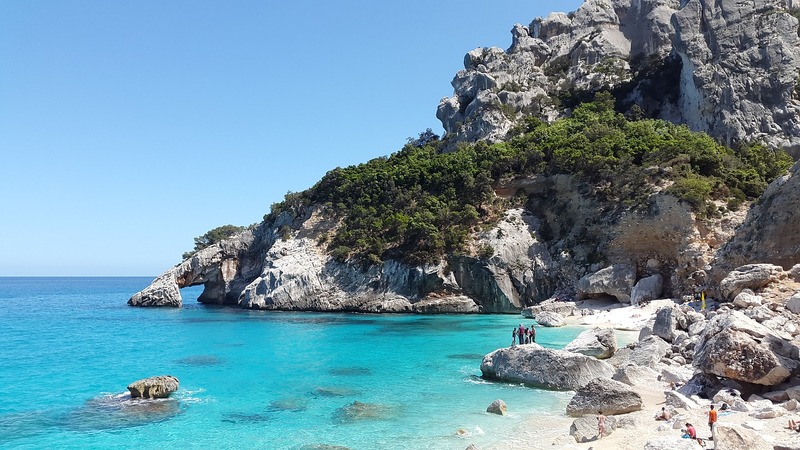 My family and I have visited many of the best beaches in Sardinia and these five beaches are the Sardinian beaches that we feel are “the best” beaches in Sardinia and probably Italy’s best beaches too. There's one particular hotel we really love. It's never easy to get into but it is perfect for discovering these beaches. The hotel is the Bue Marino and you can see photos and more here. It was not easy to decide and we had many arguments trying to decide. My son, my wife and I all had different opinions - the one I liked is first but other than that there is no particular order. Best thing to do is to visit them all and make up your own mind! Located in Orosei. This is part of a nature reserve and access is limited. You actually need to buy a ticket before they will let you in. 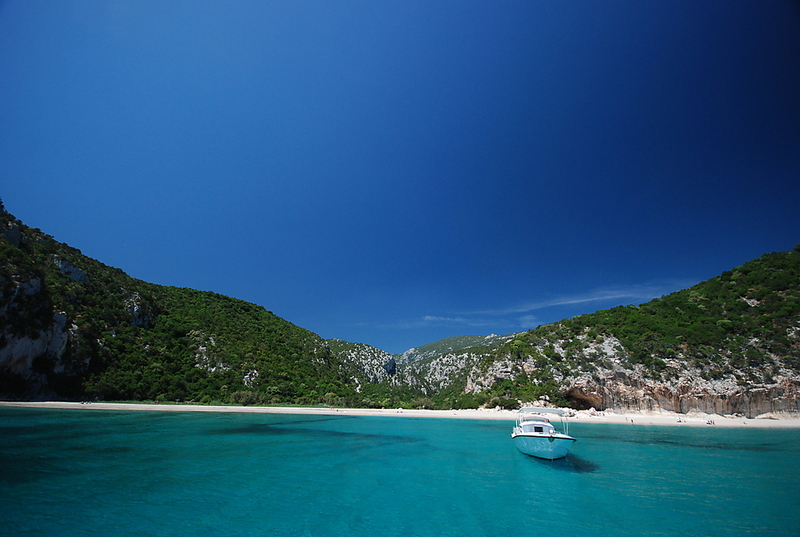 The beach consists of five pristine coves that form a natural oasis of silver sand and crystal clear turquoise waters. To get to the beach you need to walk 4 kilometers down a lovely little path that winds between junipers, pine trees, lilies and eucalyptus and where the scents of the vegetation and sea mix in a heady mix of happiness. Not only is the beach the best beach in Sardinia but I would rate it as one of the best in the world and comparable to islands in the South Pacific, Indian Ocean and Caribbean. The whole area is a secluded oasis of great natural beauty. The moment I feel the sand between my toes the worries of the world fall from my shoulders. Take the SS 125 turn off and buy a ticket at the Forest Station of Orosei. Daily admission is restricted to 130 cars so if you get there after they've let in the allocated number you won't be allowed entry...so get there early! The best beach in Sardinia? Many think this is indeed the best beach but it's number two on my list. It's a little difficult to reach, more details on getting here further on. What awaits you is a beautiful 700 meter long half moon crescent (hence the name which means half-moon in Italian) overlooking the Gulf of Orosei. Water colour is azure, crystal clear and the shallowness of the water means that it is a great place for children. The vibrant marine life, balmy sea temperatures and crystalline waters makes it great for snorkelers and scuba divers too. Just behind the beach there are rolling hills covered in lush vegetation. On one side of the beach there are six small caves and nearby, reached by boat, there is the Grotta (cave) del Bue Marino. It might seem a bit of an effort to make the trip to the cave but really I'd suggest you do...it's spectacular! Many friends of mine believe this to be not only the best beach in Sardinia but the best beach in the entire Mediterranean! I'd suggest you catch the boat leaving from the port of Cala Gonone or the one that leaves from the beach of Marina di Orosei. By foot follow the path leaving from Cala Fuili or Balnei. It must be said that the hike is not the easiest so if you don’t feel up to it, or have young kids, then boat is the best option. I've tried the hike and I now go by boat – enough said!! 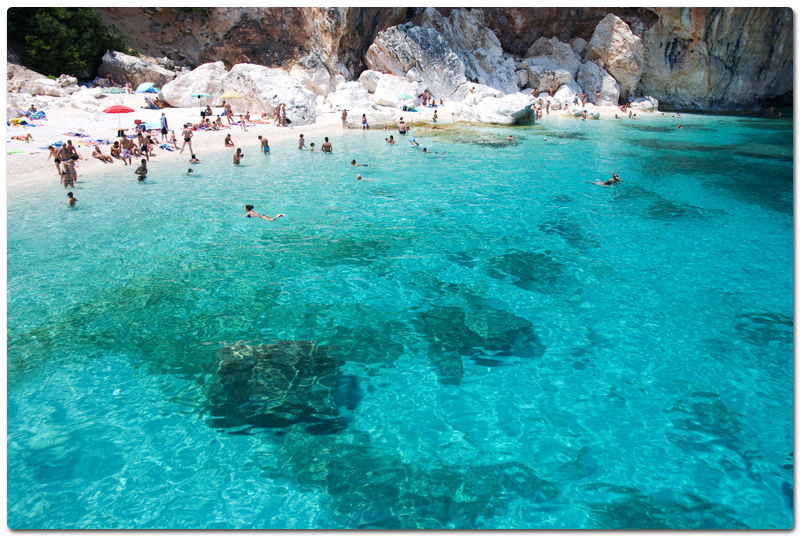 Cala Fuili, is located on the coast of Cala Gonone a little before the beach of Cala Luna and the grotte del Bue Marino. Beautiful white sand and limpid blue sea shaded by thick junipers makes this yet another beautiful beach and one of the best beaches in Sardinia. Not, in my view, as stunning as Cala Luna this beach is still exquisite and is easier to reach on foot and by car. The view from the top of the hills around the beach is out of this world. Take SS 125, follow the Cala Gonone turn and Viale Bue Marino (Avenue Bue Marino) and then road 26bis till the end. A flight of steps carved out of the rock leads down to the beach. There is parking near the beach. Cala Mariolu (means Seal Beach) overlooks the Gulf of Orosei and it is situated in Punta Ispuligi (Baunei). This beach is serious competition to all of the above and my wife rates it as as the best beach in Sardinia. Here you'll discover a seabed and beach lined with pink pebbles and the colour of the water is without doubt even more spectacularly beautiful than any of the other Sardinian beaches or Italian beaches. Photos don’t do it justice and the deep azure blue of the water reminds one more of a swimming pool. An uncontaminated paradise of incomparable beauty, this is another great beach for children who can play safely near the shore in the shallow water. Bigger children and adults can have a great time exploring the nearby caves. Cala Mariolu is a great beach for snorkeling and scuba as well. By sea is best on one of the many boats leaving the ports of Cala Gonone, Arbatax and Santa Maria Navarrese. It can be reached by foot but I have never tried to do so and it is meant to be an arduous hike. If you want some serious exertion before relaxing on perhaps the the best beach in Sardinia then go for it!! 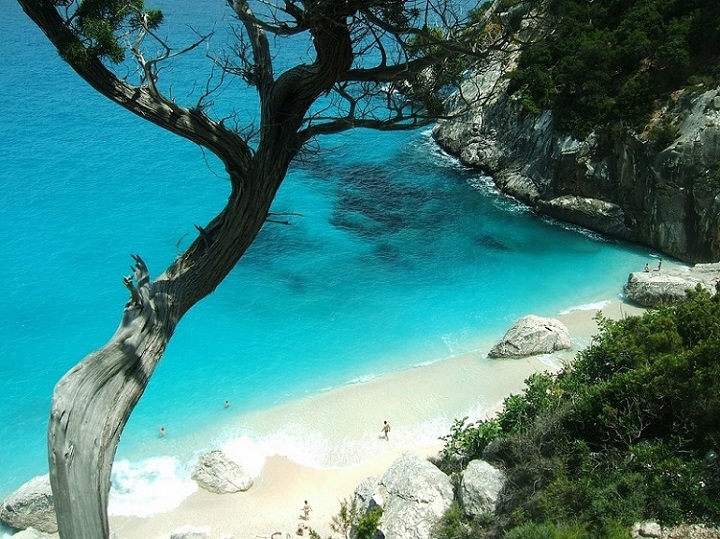 Another candidate as the best beach in Sardinia and indeed one of Italy’s best beaches. The beach has white stones mixed with sand, and it offers an amazing view the Punta Goloritzè peak. From above this beach is simply gorgeous. I don't think I've ever seen anything much more beautiful in my whole life. The more I think about it the more I realise that this could just as well be at number one on the list. Best thing to do is to visit them all and decide yourself and if you stay at the Bue Marino in Cala Gonone for a week you'll easily manage to visit them all. Boat trips to the beach have now resumed after having been stopped for awhile. Boats leave Cala Gonone and Santa Maria Navarrese. Hike in if you are very energetic. The fact that this beach is so difficult to get to helps to ensure that it is near the top of the list when it comes to finding the best beach in Sardinia. The best way to explore the east coast of Sardinia, where these beaches are, is to base yourself in Cala Gonone and spend a week or more exploring. As I've mentioned; my personal favorite hotel, right on the beach in Cala Gonone, and perfect for visiting all the beaches featured is a hotel called the Bue Marino. Definitely our favourite beach hotel in Sardinia! For more of my best hotel picks in Sardinia click here. Where are these beaches? Click here for a map.